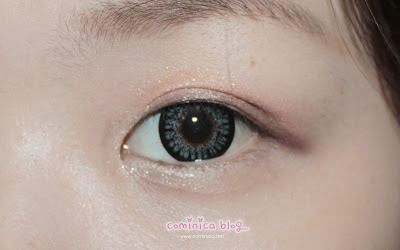 Prepare your favorite brown eyeshadow palette, I was use Majolica Majorca RD784. 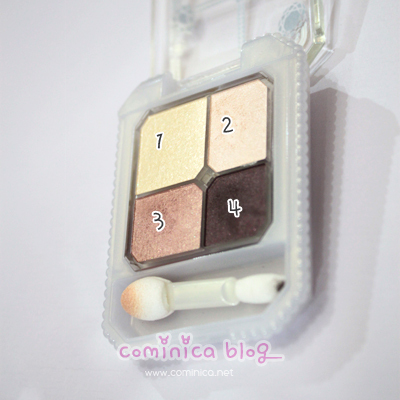 This palette has most color which Gyaru always use and has a natural looking brown. I use a brush from this palette for apply it, except for blending I use a crease brush. 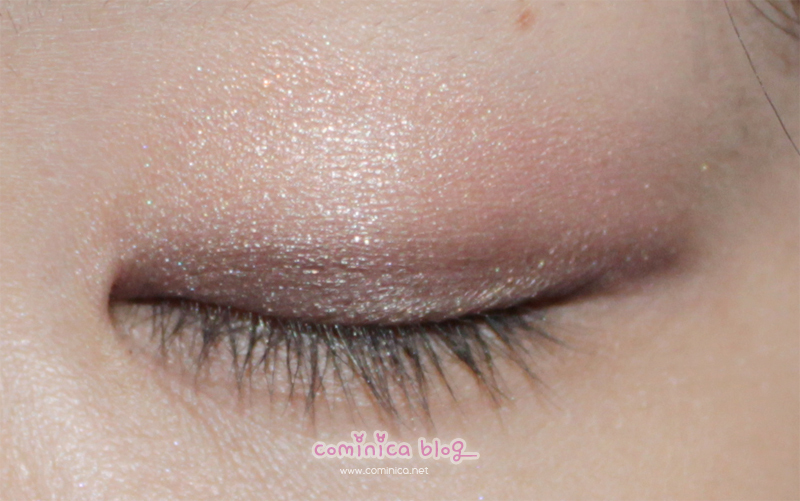 ღ Put an eyeshadow base all over your eyes, you may not put a base, but this will make your eyeshadow look vibrant. (especially for a palette like this). ღ Color your eyebrow, I use a brown color for my eyebrow. I never want to use black, I look like shinchan. lol btw sorry for my silly application, I never put attention for my brow coz my bangs will make it not visible. Red dots is number 2. Black dots is number 3.
ღ Put a dark brown color (number 4) close to your upper line. This will make your eyes look more define. This is how my eye look after this step. You may not see the color but believe me in real life the color look more vibrant but still look so natural. When it's close, remember to BLEND the harsh line okay. 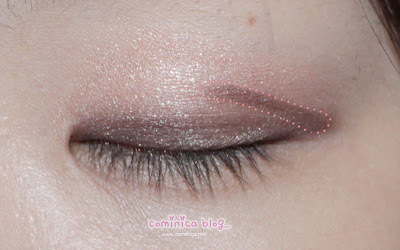 ღ Put a dark brown color again just on your crease, this will define my small eyelid. Don't forget to blend it soflty. This is how it looks, my lid look more define and deep. ღ Highlight it, use number 1 the lighest color in this palette onto your brow bone and inner corner of your eye. I don't know why the color won't show but in real life it looks pretty intense because of the glitter. ღ Apply number 3 color, a medium and bright brown color on the center of you lower line smudge it to the edge. 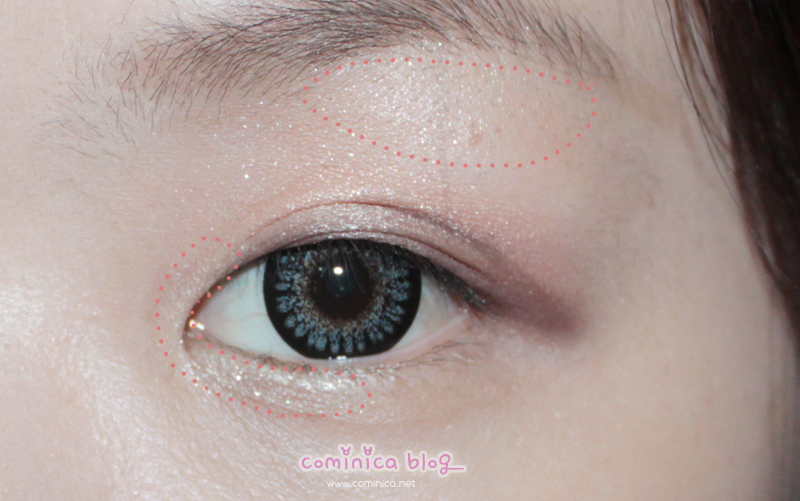 ღ Take a dark brown color and apply it like a V shape on the outer corner of your eye. This will enchance your eye size while using a false lashes later. U may not do this step but believe me you will love this step. ღ Put a liquid eyeliner, extend the line like the picture. This line is going to blend with your false lashes later. ღ And onto my favorite part! 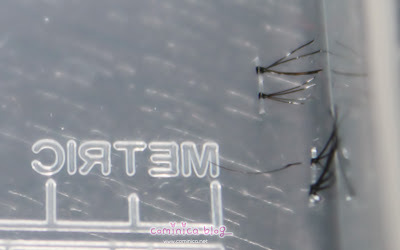 Put a false lashes, yay, look how the false lashes line blend into the eyeliner line? It looks natural and not weird. ღ Don't forget to apply mascara to your upper lashes, you may use and electric curler to curl it if you don't want to change the shape of your false lashes. This is after put false lashes on both eyes. I already cut my lower lashes to small part like this. ღ Put a mascara to your lower lashes, put more attention to it. ღ After that put this small part of lower lashes, you may apply 2 parts or 3 to your eyes. See the left one is with a lower false lashes, I put three of them. See the difference? ღ Okay, so put the lower lashes to your other eye and you're done! Don't forgot put you favorite blush and lipstick to make your face look fresh and complete your look. (＾▽＾) If you use your favorite color you'll feel happy and confident because of it. This is the total look. I use a doll pink blush and baby pink lipstick color. (Since I love pink color so much!⊙▽⊙) Sorry I forgot to capture this coz I really in a rush yesterday (ﾉTДT). Great tutorial! Thank you! *_* You look great! great and easy to follow ur instruction via picture. 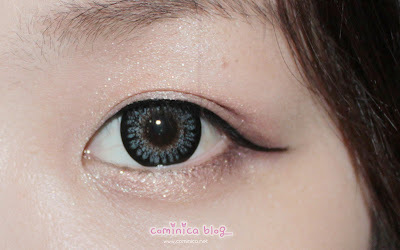 wow, i super super love this look..
like the detailed tutorial.. easy to follow! love your pink kissable lips.. and your lovely silky hair! doll eyes! I love it! Thanks for the tutorial :] I'm gonna try this out when I'm going out later. And your look really cute. wogh! thanks for the tutorial.. I love gyaru style <3. thanks for doing this tutorial :) You look beautiful. Such a cute look. You've such pretty eyes! IMO. I don't think it's gyaru. I've seen this type of make up a lot on Anecan. Not sure if you've heard about it but it is a Japanese magazine targeted for mid 20-late 20s. Their make up are pretty similar to yours. it looks natural! love it! thanx tutorialnya. seperti biasa cantiikk lohh. Do you think this will work for caucasian eyes? Woah you look super ulzzang : D so cute!